Tisha B’Av (lit. 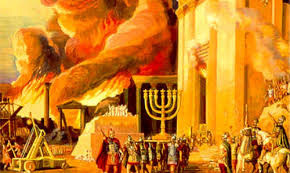 “the ninth of Av”) (Hebrew: תשעה באב‎ or ט׳ באב), is an annual fast day in Judaism which commemorates the destruction of the First and Second Temples in Jerusalem and the subsequent exile of the Jews from the Land of Israel. The day also commemorates other tragedies which occurred on the same day, including the Roman massacre of over 100,000 Jews at Betar in 132 CE. Instituted by the rabbis of 2nd-century present-day Israel, Tisha B’Av is regarded as the saddest day in the Jewish calendar and a day which is destined for tragedy. In addition to the basic five prohibitions, all pleasurable activity is forbidden. The Book of Lamentations which mourns the destruction of Jerusalem is read in the synagogue, followed by the kinnot, a series of liturgical dirges which lament the loss of the Temple and Jerusalem. As the day has become associated with remembrance of other major calamities which have befallen the Jewish people, some kinnot recall events such as the murder of the Ten Martyrs, the decimation of numerous medieval Jewish communities during the Crusades and the destruction of European Jewry in the Holocaust.